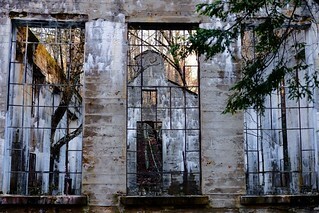 Carbide Willson ruins - Happy Window Wednesday! “Carbide” ruins, Gatineau Park, Chelsea, QC. “Thomas Leopold Willson (1860–1915) was an inquisitive, adaptable, Canadian inventor. He experimented with a range of industrial and chemical processes, including a lighting system that failed to find a market and electro-thermal reductions of metallic oxides, which did result in marketing success. Willson is best known for his commercial process of making calcium carbide and using it to generate acetylene fuel. Although another inventor in France also made calcium carbide in the same year (1892), Willson’s technique was cheaper. Willson’s technique led to the formation of what became Union Carbide, which is now owned by Dow Chemical. In 1895, Willson developed a carbide industry on the Welland Canal in southern Ontario, expanding with plants in Ottawa, and in Shawinigan, Quebec. Acetylene lighting became the standard for lighting on streets, in buildings, and in car headlamps and marine signals, making “Carbide” Willson a successful industrialist. His Ottawa-located International Marine Signal Building—the manufacturing site of acetylene-fired marine buoys and lighthouse beacons—was reputed to be the longest building in the British Empire. Willson fulfilled his industrialist role socially, as well. He settled in Ottawa in 1901 with a home on Metcalfe Street and a summer house on Meech Lake in Gatineau. Willson was a member of several social clubs and hosted many political and social events. He also loved new and grand schemes. He was the first automobile owner in Ottawa and included laboratories in his home and his summer house. Willson’s wide-ranging experiments resulted in over 70 patents and earned Willson a University of Toronto prize for his discoveries. Willson also applied his innovative ideas in a number of industries: carbide, pulp and paper, railways, dams, and fertilizers. One of Willson’s innovations involved the production of a nitrogen-based solid that could be ground up and used as fertilizer. Willson believed that the process could revolutionize agriculture and in 1912, set out to establish a small fertilizer plant at Meech Lake. His project was financially backed by Interstate Chemical, an American fertilizer company, and James Buchanan Duke, the American tobacco and textile millionaire known for his financial support of what became Duke University.